The Doctor, Rose, and Jack Harkness find themselves separated, waking up with temporary amnesia in various mid 2000's television game shows. The Doctor finds himself in a Big Brother house hosted by the Davinadroid, Rose ends up on the set of The Weakest Link hosted by Anne Droid, and Jack wakes up facing two female androids who offer to give him a makeover on a show similar to What Not to Wear. This won't date badly, not at all. In one of "The Weakest Link" sequences, one of the correct answers is revealed to be Torchwood, the first appearance of the name in Doctor Who; it would become the story arc for the second series. Apart from the fictional Bear with Me, all the other shows Lynda mentions as coming from the Game Station are based on British game and makeover shows: Call My Bluff, Countdown, Ground Force, Wipeout and Stars in Their Eyes. The production team originally intended to show Jack's naked buttocks on screen. The scene was shot, but the BBC's editorial policy department stepped in and vetoed it, the only time they over-ruled the production team during the 2005 series. During the actual recording the director instructed the scripted Weakest Link questions were randomised so that the cast would actually have to think about their answers. 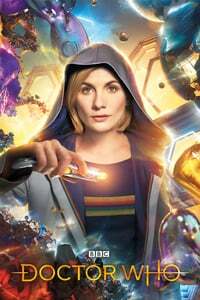 This episode introduces the deadlock seal, a type of lock which is immune to the Sonic screwdriver and will be used again in future episodes. The diary room chair used in the Game Station Big Brother house was sold to Channel 4, and they used it in Ultimate Big Brother as the bedsit's diary room chair. "Someone's been playing the Long Game"
I'm sure that non-2005 audiences find this show just as baffling as non-UK audiences did in 2005. As I remember it worked, more or less, storywise -- but came off (referencing the last thread about the current series) as a bit panto, you know, "We're just having fun here." But that tone is undercut by the apparent real deaths of characters. Yeah using contemporary game shows was just a terrible idea, and really undercuts what is a pretty decent episode other than this problem. It's very much a certain kind of Doctor Who episode. Like the Happiness Patrol or Terror of the Vervoids. It makes you say "You can't possibly be serious," and on the one hand it's just a bit of fun, but on the other hand, yeah it is trying to be serious. I just ruefully shake my head, laugh, and take it for what it is. The production team originally intended to show Jack's naked buttocks on screen. Has this cutting room floor footage ever surfaced? Asking for a friend. It's a shame they ruined the reveal at the end of this episode in the "Next week" teaser in the previous one. What's funny about the game shows they chose is that they are dated, yet still modern enough that they read as parody of today rather than anachronisms. (Even though it's only been nine years, with the exception of Big Brother which still airs I guess.) I think you'd have to substitute something substantially older, say Liar's Club to pick an American show or maybe Give Us a Clue in Britain, to have it read as something out of its time. The game shows are silly and I can see how they trip people up in their enjoyment of this episode. But the other bits of the episode are so good that I always forget the opening. And, though I wouldn't call myself a huge shipper when it comes to anybody on Doctor Who except for Barbara and Ian or Amy and Rory, but there's no doubt in my mind that the moment where the Doctor says to the Daleks "Because this is what I'm going to do. I'm going to rescue her...I'm going to save Rose Tyler from the middle of the Dalek fleet" is the moment where Rose realizes totally and completely she's in love with the Doctor. I don't know how you can read the look on Billie Piper's face any other way.